Have Sam Beam and Robin Pecknold’s latest albums left you a bit underwhelmed? Need something to fill that folk void in your heart? 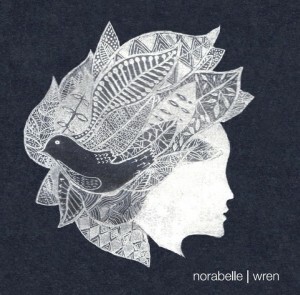 Why not try Wren, the debut album from Norabelle. Filled with sparsely textured beauty as well as gorgeous melody, it’s just the kind of folk brilliance you’ve been looking for. See, I easily could work in advertising. Like most advertisers, I’ve somewhat oversold the product, but sure isn’t that what it’s all about. However, Wren, is a triumph of a debut album, and a great leap forward from last year’s EP Come the Bluest Dawn. Unlike many acts, who just revamp their EP for their first full-length, Norabelle’s debut features eight entirely new songs, recorded and mixed by the fantastic Stephen Shannon. The first two tracks ‘Gregarious Bird’ and ‘Checkout Line’ are both slow burners, clocking in at over fifteen minutes combined. However, there’s enough in Ken Clarke’s smooth vocal and Shane O’Hanrahan’s melody to keep you interested. Shannon also provides bass on the record wit Stephen Ludlow on drums and the record’s rhythm section support the eight songs wonderfully, with not an extraneous note or beat. It’s understated yet always feels right. The soaring title track provides a much-needed injection of tempo, which in turn brings up the album’s weaknesses. For all its sparse beauty, Wren is an album that requires engagement from the listener. It won’t be immediately welcoming to the casual listener, despite the best intentions of the glorious ‘Ghost’. It’s an album that requires repeated listens, and an awful lot of love. But if you give it your time, you will be rewarded. And if I grabbed your attention with the names dropped in the first line of this review, then you already know what’s being asked of you. A very solid debut, but it won’t be for everyone. However, if you’re a folk-lover like me, you’ll devour all these immaculately crafted eight courses. Recommended.